Stormwater runoff is precipitation from rain or melting snow and ice that flows across the ground. 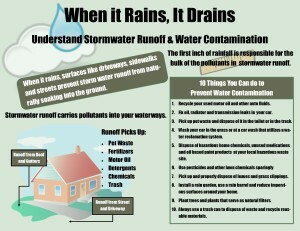 Stormwater may seep into the soil, discharge directly into streams, lakes and rivers, or evaporate into the atmosphere. In nature, most precipitation is absorbed by trees and plants and soaks into the ground. This results in good water quality. 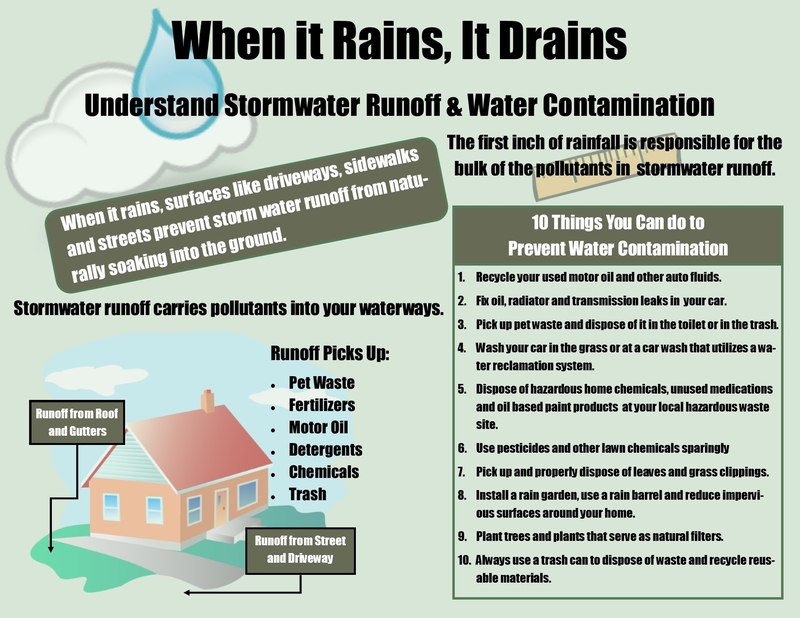 In a developed environment, as the runoff flows over the land or impervious surfaces (paved streets, parking lots, and building rooftops), it accumulates debris, chemicals, sediment or other pollutants that could adversely affect water quality if the runoff is untreated. Listed below are easy things you can do to help stop contamination in our streams, lakes and rivers. Recycle your used motor oil and other auto fluids. Never dump oil or antifreeze down storm drains. Promptly repair oil or other fluid leaks in your car. When it rains, water runs over the ground and picks up oil, antifreeze and other pollutants and carries them to our streams, lakes and rivers. Use kitty litter to absorb the leaking fluids from the ground. Pick up pet waste and dispose of it in the toilet or trash. Storm drains do not connect to the sanitary sewer systems and treatment facilities, so pet waste can be the cause of significant stormwater pollution and present health risks to humans and pets. Wash your car in the grass or at a car wash that utilizes a water reclamation system. Soap and dirt from washing your car flows through storm drains and ditches and ends up in our waterways. Dispose of hazardous home chemicals, unused medications and oil based paint products at your local hazardous waste site. Use pesticides and other lawn chemicals sparingly. Follow the instructions and do not apply if rain is forecasted. Pick up and properly dispose of leaves and grass clippings. Never use streams, ditches or street gutters to dispose of yard waste. Install a rain garden, use a rain barrel and reduce impervious services around your home. This will reduce the amount of flooding, erosion and pollution to our waterways. Plant trees and plants that serve as natural filters. Plant leaves, branches and flowers catch rain drops before the water hits the ground and becomes runoff. Plants also help manage stormwater runoff by allowing water to infiltrate into the soil and absorbing and filtering it. Always use a trash can to dispose of waste and recycle reusable materials. Don’t litter! We can all help prevent water contamination while protecting our health and environment and saving money for ourselves and our community. Water pollution is everyone’s problem and water quality is everyone’s responsibility.